Union Place Breakfast blend coffee is great tasting and cost effective. Union Place Breakfast Blend Coffee is a medium roast premium coffee, medium bodied for a smooth harmonious cup, without bitterness, pleasing to a broad group of office coffee connoisseurs. Locally roasted and packaged to the highest quality standards for a taste your office crowd will appreciate and a cost effective alternative to full service coffee vending. Union Place Blend Coffee is pre-packed in convenient 2 oz packets; easy open and ready to brew the perfect 10-12 cup pot. Get a 20% discount on orders over 10 cases. 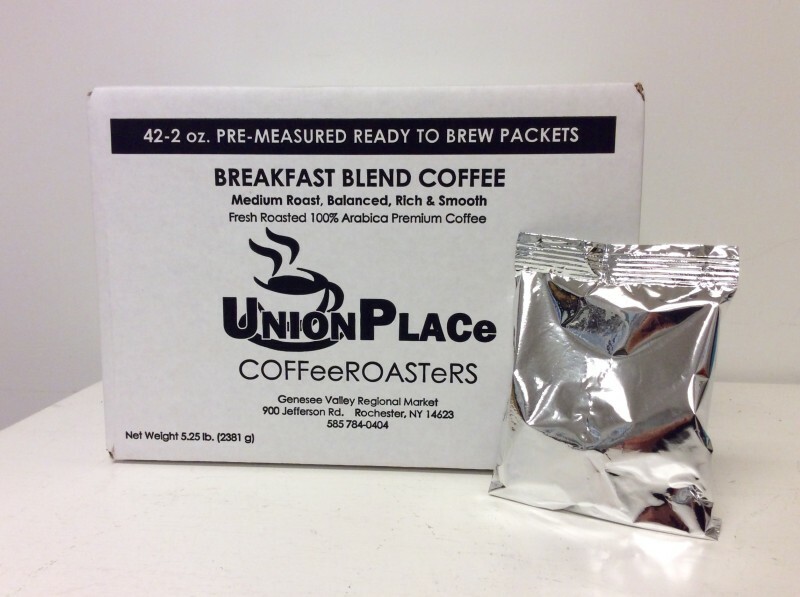 Union Place Breakfast Blend Coffee is locally roasted and packaged to the highest quality standards. Uncompromised quality and taste you will appreciate, satisfying a demanding office coffee crowd. A cost effective alternative to full service coffee vending. Union Place Breakfast Blend Coffee is blended with Central and South American beans producing a mild, smooth and harmonious medium bodied cup, without bitterness. Union Place Breakfast Blend Coffee receives the approval of coffee professionals and the discerning coffee drinker like you. Using sustainably farmed coffee beans from socially and ethically responsible importers committed to creating a win-win for all, the farmer, the importer and the coffee consumer. By providing training and assistance in agricultural best practices, water conservation and farm management, our importers are committed to improving the life of coffee bean farmers and their families, while protecting the environment. By assisting coffee farmers reduce costs, increase production of high quality coffee beans and negotiate better prices for their coffee crops these communities improve their quality of life. We are proud to partner with these quality importers.